What about that elevation chart?!?! This Saturday i’m running the RunningWild Mt Solitary 45km Ultra in the Blue Mountains, and although i’m looking forward to the last long run before my taper, it’s going to be the toughest course I have ever run to date! So in preparation for this big race I decided to go for a massage yesterday and i’m so glad that I did, my body feels so much better today. Now for some carb loading and a few good night’s of sleep before the early start n Saturday. In other news, today I was interviewed by a journalist for an article that will be published in Runners World magazine (I’m not sure which issue yet but I’ll keep you posted). 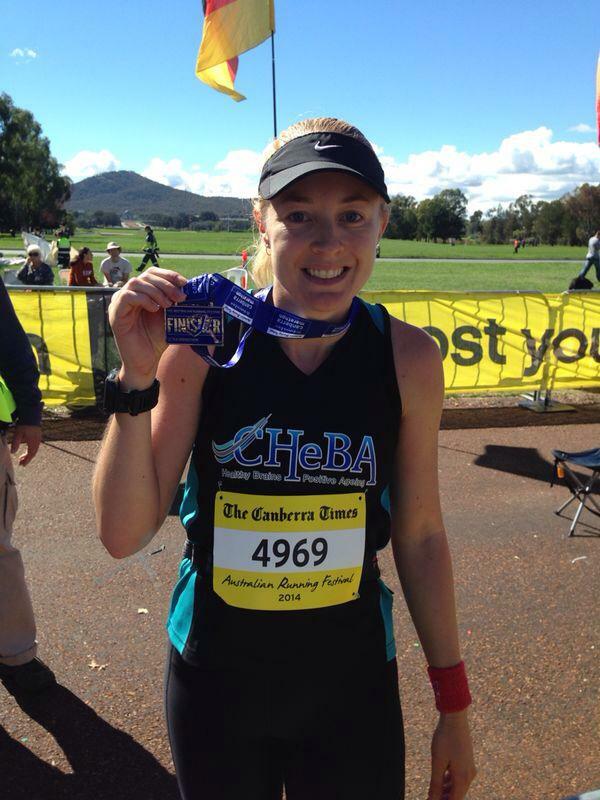 The story will be about my running and also about my Fitness Ambassador role with UNSW Centre for Healthy Brain Ageing (CHeBA). I’m so excited about being in a magazine that I’ve been reading it for years, and I even get a photo shoot so they can include a picture of me running. I’ve always thought that with every race there is a new lesson to be learnt and challenges to overcome. Last Sunday definitely proved me right as I’ve learnt a great deal from the whole experience. With only 5 weeks remaining until my first 100km ultra marathon I was keen to see how my body would cope running 50km on the road, so that had been the reason I signed up for this race. Well it was that, and also the heckling from my running mates who are always pushing me to have a go, of which I am very thankful. 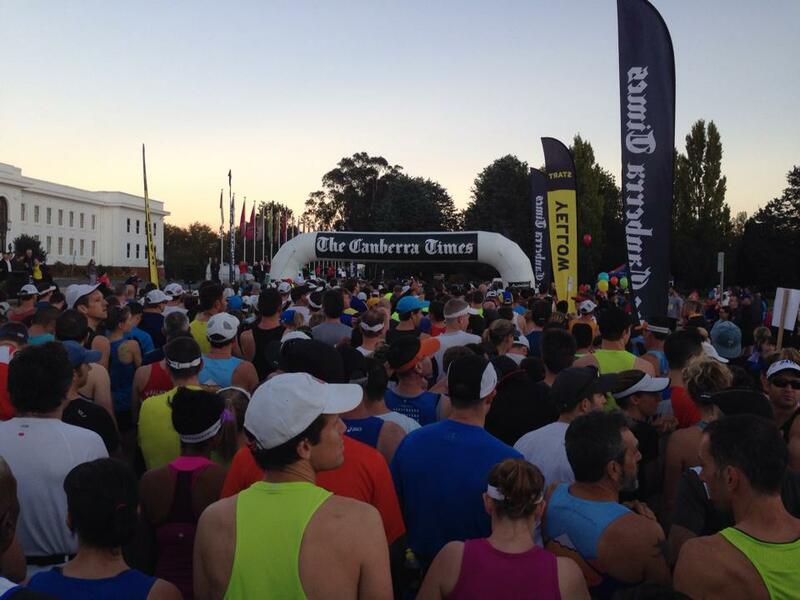 So last Friday at lunchtime my friend Georgie drove us down to Canberra for the running festival. 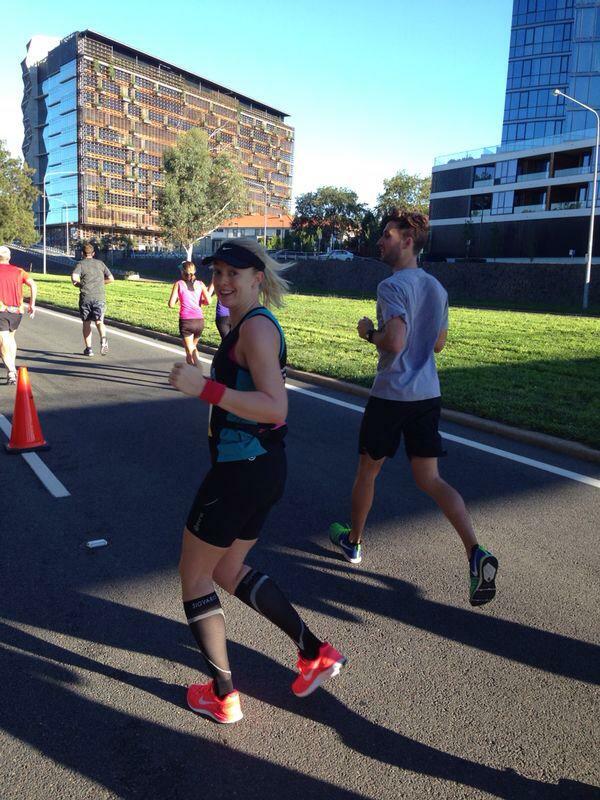 She was racing in the 10km on Saturday, along with Todd from SHRunners. There was quite a large group heading down for the events so we all planned to cheer them on during their race on saturday and then they would repay the favor on Sunday. However I felt like I was cheating them all as I knew I would be out there for the longest amount of time, as i was the only one from our group doing the ultra. On Saturday we got up bright and early to head to the start and see them off. We raced around cheering them on at a few different points along the course and then saw them at the finish line for some final encouragement. Georgie got a new PB which was fantastic, and Todd was happy to finish as he’d been battling a cold all week prior to the race, as well as still being in recovery mode from a stack a few weeks back. 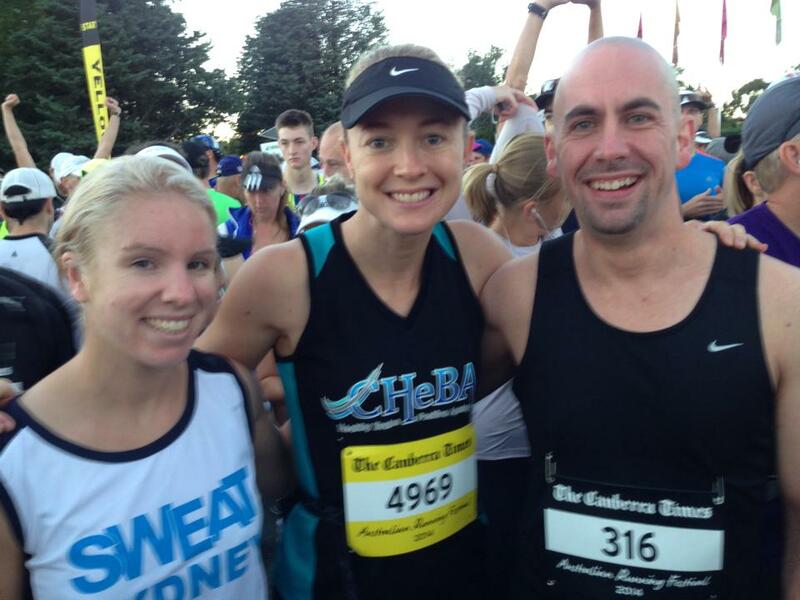 I was also lucky enough to spot an old family friend Jess as she ran over the finish line, as well at Matilda who had used my 10km entry bib to take part in the event. 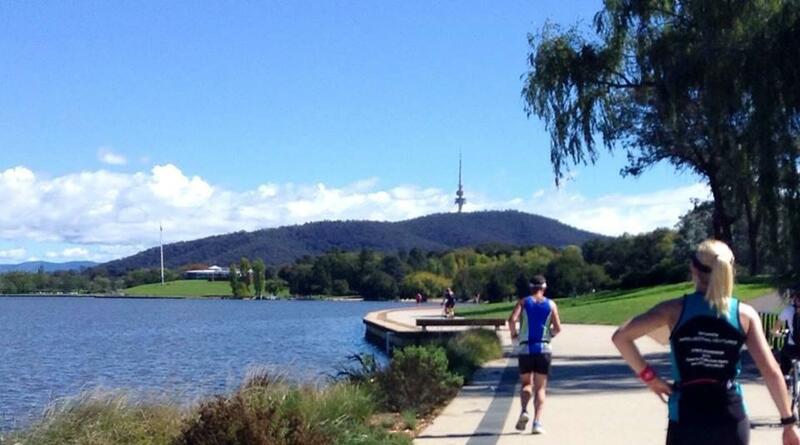 Originally I had signed up for the 10km course, however I had changed my mind closer to the event and had given her the entry as she was a local in Canberra and was keen to run when I contacted her. The morning was lovely and when I got back to the hotel I decided to have a nap before the afternoon’s adventures, which consisted of going to watch the 3pm game of Raiders v Knights at GIO Stadium with Georgie & Todd, followed by 6pm dinner with our group to carb load. I had a lovely penne bolognaise for dinner at the restaurant and got back to my hotel so I could be in bed by 9pm. I hadn’t slept well the night before so I was feeling very tired and wanted to get as much rest as possible. My alarm went off at 4am on Sunday and I got up to have some toast and a banana for breakfast, as I wanted to make sure that I ate more than 2 hours before the race start time. So I went back to bed for 30 minutes after breakfast and then got up and prepared for the race. We were leaving the hotel at 5.20am to walk to the start line located just across the bridge about a 20 minute walk away. There were quite a few people doing the half marathon and a few also doing the marathon, including two of our runners who were competing in their first ever marathon, Janet and Brendan. I was so glad that the marathoners and ultra runners were doing the same course too as it meant we got to run with them for the first 42.195km before heading to our extended lap around the lake. Here’s a few of queuing outside the loos before the race, that’s me on the far right. 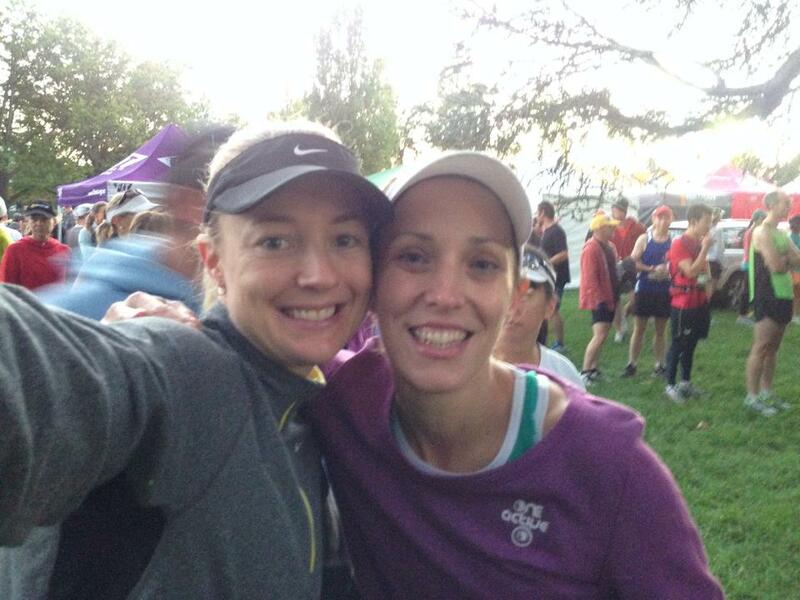 I ran into some of my Sydney Striders buddies and had a quick selfie with Emma who I have been lucky enough to share some trails with over the past 6 months. She was locked in for the marathon and I wished her well. 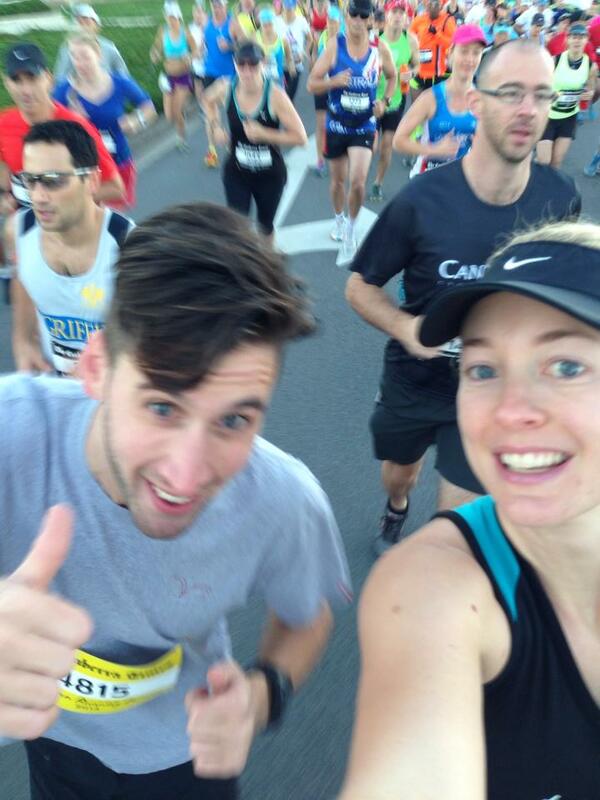 I also ran into Tilly and Brendan at the start line and we had a quick photo before the gun went off. Tilly was unfortunately struggling with a cold (which later turned into Laryngitis, I still can’t believe she finished the race!) and Brendan was popping his marathon cherry!! 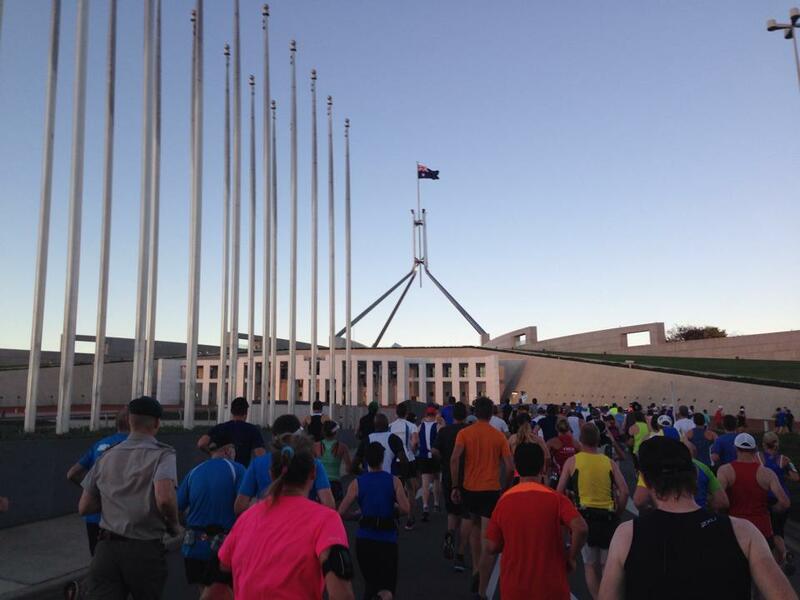 The gun went off and our first section ran around the Parliament house, here’s a shot I took as we ran up the first hill. If you look closely to the left of the screen you can spot a guy wearing his full army uniform, we saw him a few times and he didn’t even break a sweat. What a machine! I also managed to get a selfie of myself and Rob from the Nike Sydney Store (below) as we ran up this first hill, it’s a bit blurred but not bad to say were were actually running when I took it. It was at this point I handed my phone to our guys in the crowd, hopefully they would get some shots of me with in down the track. We wouldn’t see them again until about the 15km mark. Rob and I ran a lot of the first 20km together, he’s quicker than me but was also using this run as a training event for TNF100. We also had the pleasure of being accompanied by Kathy (Kathleen I think) from the Sydney Striders. 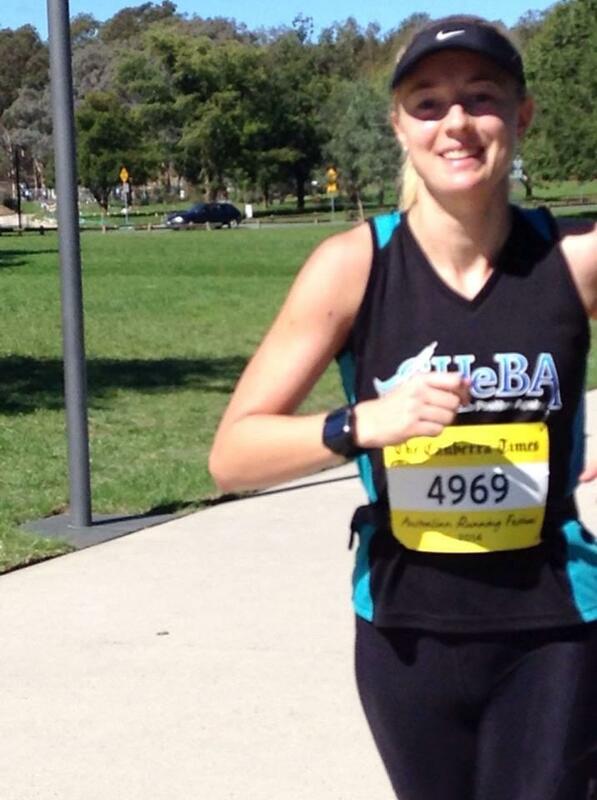 I had met her only the weekend before at the 10km race in Lane Cove where Simon had paced us all the way to the finish. Kathy was lovely and had a great sense of humour so it was really great to have her with us at this point too. 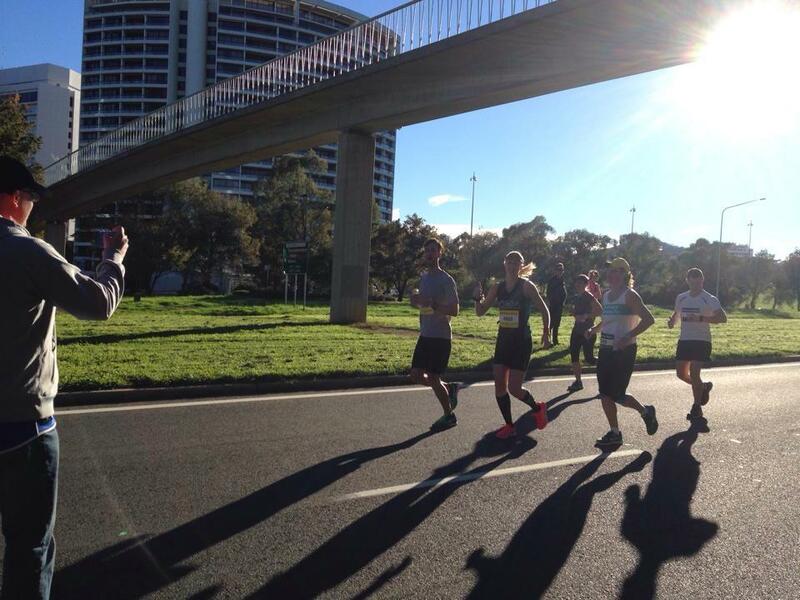 As we approached the 15km mark we were looking out for our crew and there they were. Todd, Georgie and Megan all cheering us along. It was so good to see them and take my mind of running for a moment. It was this point that I finally felt warm and could feel myself getting into a rhythm. This course was going to be pretty flat so I wanted to make sure I concentrated on not thinking about my legs or my feet. Unfortunately my plan failed. By the time I got to 21km Rob had taken off and was building his gap with every out-and-back section that we saw him. Go Rob! So it was Kathy and I who stuck together for a little bit longer, we chatted and laughed and made friends with some of the other runners around us. I always like trying to make them smile as runners can sometimes look so serious during a race. Then I walked. I wasn’t even half way and I was walking. I was so angry at myself for walking but my head was struggling. I had to let Kathy go unfortunately and I tried to turn my thoughts more positive. I ran. I walked. I ran. I walked. I walked. I ran. I walked. BY the time I got to the 25km point the soles of my feet were aching and I felt like my feet were the size of balloons. Every step felt painful to the pads of my feet and I was struggling not to think about it. I probably should have done some longer distance road runs in the lead up got this race, as my feet clearly weren’t used to hitting the pavement after all the trails I’ve done lately. Mental note to self. I kept running and walking, and where possible I ran on the grassed sections to alleviate some of the pain. It didn’t seem to be getting any worse but it felt like the soles of my feet were bruised all over. All I could think about was taking off my shoes. Then I tripped on a long blade of grass and I felt pain in my groin in the same spot that had been giving me issues about a month back. This was not turning out to be a good day. I shortened my gait to try and minimise the groin pain that had started and i’m pretty sure if there were any photos of me during the middle sections of the race there would not be a smile. 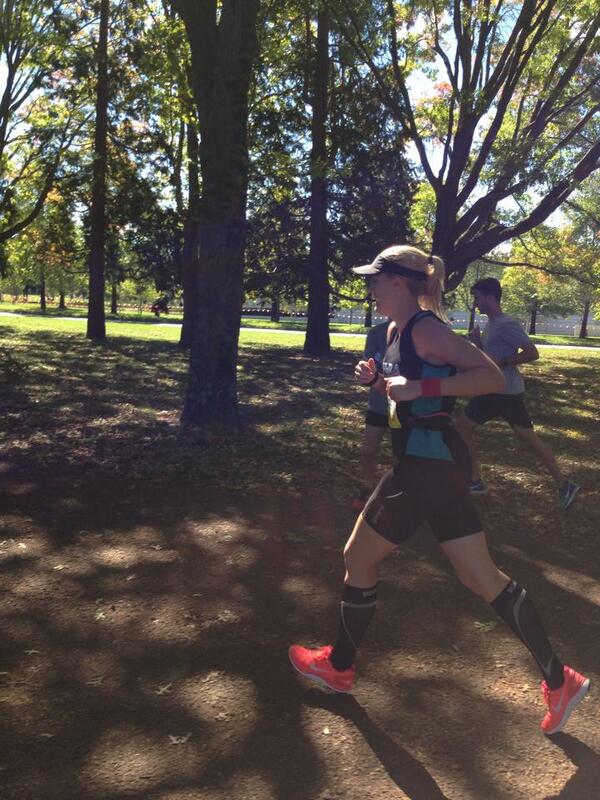 But the sun was shining and I was determined to finish. I ran. I walked. I walked. I walked. I ran. I walked. There were many sections on the course where there was an out-and-back and you got a chance to see the other runners. This was the only thing that kept me going, knowing that my mates were out there enduring this too. There support and encouragement kept me in better spirits than I cold muster. For the next 3 hours I Ran and walked and tried to stay positive. It was the toughest race of my life mentally, and I think I have even blacked out some of it as I don’t know what else to write here about that part of the race. It was flat, a few hills and undulating sections and the sun was shining. Thankfully when I got to about the 37km mark a lovely man who was cheering on runners ran with me for about 1 km and we had a chat as he got me back running again. I don’t know who he was but I was very thankful. And as we went up over the hill I realised there was a large crowd of people ahead and it really lifted my spirits to see so many people out here supporting there loved ones. This was a great mood lifter as it was an out and back and i knew that I would get to run through here again at about the 40km mark. So I kept running, and slowly overtook a few more people. I found a bit of a rhythm again and when I got back to the same part with the crowd I spotted Anne from work. I was so excited to see a friendly face and I gave her a hug as I ran around the corner. For the marathoners they only had about 2kms to go, so I cheered them on and wishes them well and did everything I could to not think about the pain in my feet and groin. I made my way up around a roundabout and turned left, then heard a man with a speaker announcing Marathoners to the right, Ultra runners to the left up onto the bike path. I was running up on the grass at this point and the guy on the microphone encouragement me to get back down onto the pavement and onto the course. He didn’t know the pain in my feet but I did as he said and kept running. I got to the section where the marathoners were heading for the finish and I saw Russell from the Striders, I yelled out and encouraged him to crank it to the finish line as I followed the path towards our final lap around the lake. My brain was over it, I just wanted to be finished. But I ran and walked when I needed to and about halfway along this section I realised it was an out-and-back so I got to see many other ultra runners who looked like they were in as much pain as me. We all cheered each other on and this really helped my mood to lift a little. I had less than 10kms to go. Then I saw Matilda, I was so happy to see her. She had even brought down her beautiful dog to cheer me on. I gave her a hug and kept running towards the turn around point. As I rounded the bend I made sure I’d let the other runners know they were close to the turn around too, I knew the boost would help lift their spirits too. I followed the path and took a left back up onto a bridge and when I got to the other side I saw Matilda again. She had come along to run/walk this section with me and I cannot express how much I needed her company and smiley face right at that point. She ran ahead and got a few photos for me and we chatted about her 50km run that had been in the very same section of the course. I really enjoyed running with Matilda and talking to her so a big thanks to her for taking my mind away from the pain and putting the smile back on my face. I owe you honey! I crossed the last bridge at the finish area was in my sights. All I could think about was the faster you get there the sooner you can take your shoes off. My get felt huge and I just wanted to sit/lay down. So I picked up the pace and then all of a sudden Parker was next to me running and cheering me on, he was a friend Karie’s from run club husband and a good runner too. He told me I had shot last him while he had been keeping an eye out so had to sprint to catch up. How lovely of him to be there. Then I got closer to the line and Rob came to run with me too. I felt bad as he was trying to talk to me but I didn’t really have any words left and I was out of breath trying to speed up for the finish. Poor Rob, I hope he didn’t think I was ignoring him. I was just stuffed. Then i rounded the last U-turn and could hear all my crew cheering and waving and I couldn’t believe that I had made it. 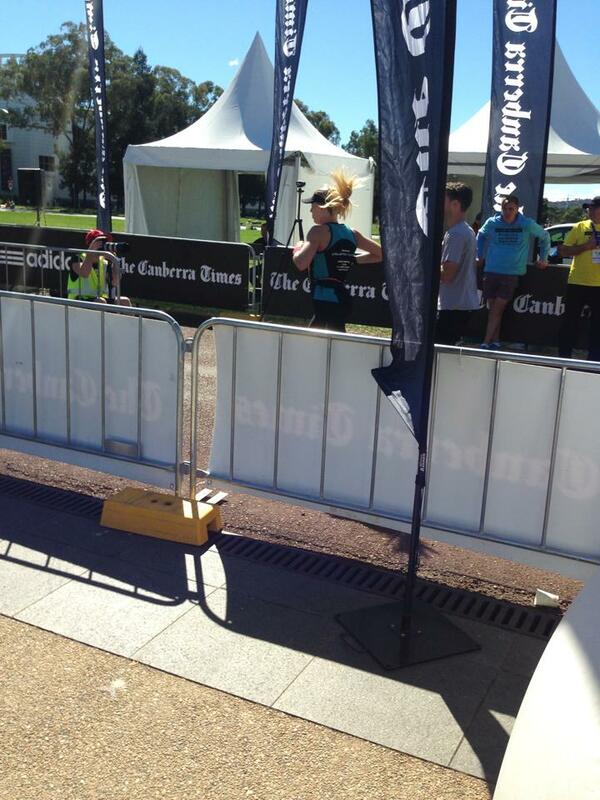 I sprinted the finish and overtook a couple of people in front of me. 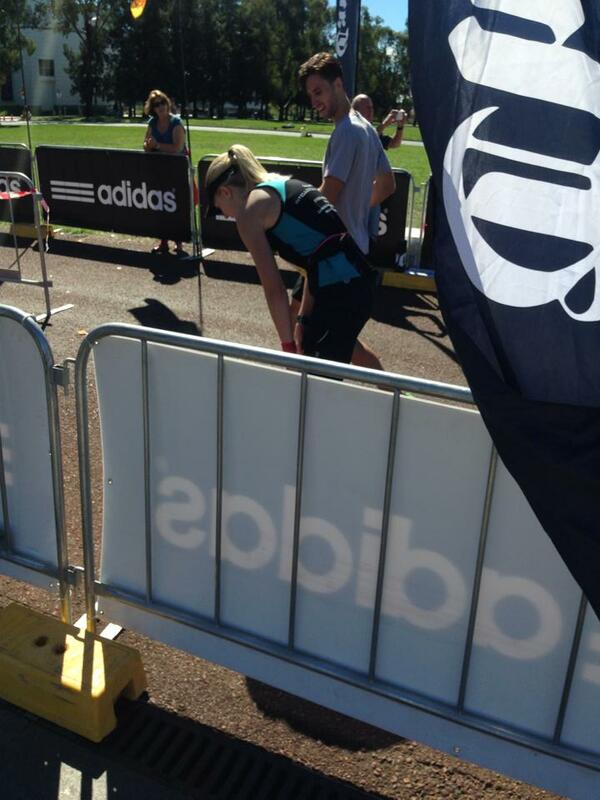 I’m not sure where the last spurt came from but I was so glad to have stuck it out and made it to the finish line. How cool was the medal!?!? I grabbed some water and some bananas and got hugs from all of my team mates who cheered me up with their smiley faces. I owe so much to these guys for always supporting and encouraging me in the lead up to this race and many others. I love running with you guys and I know I can always count on you. We went back to the hotel and showered and then headed for a recovery meal at the same place we’d had brekkie the day before. It was delish!! 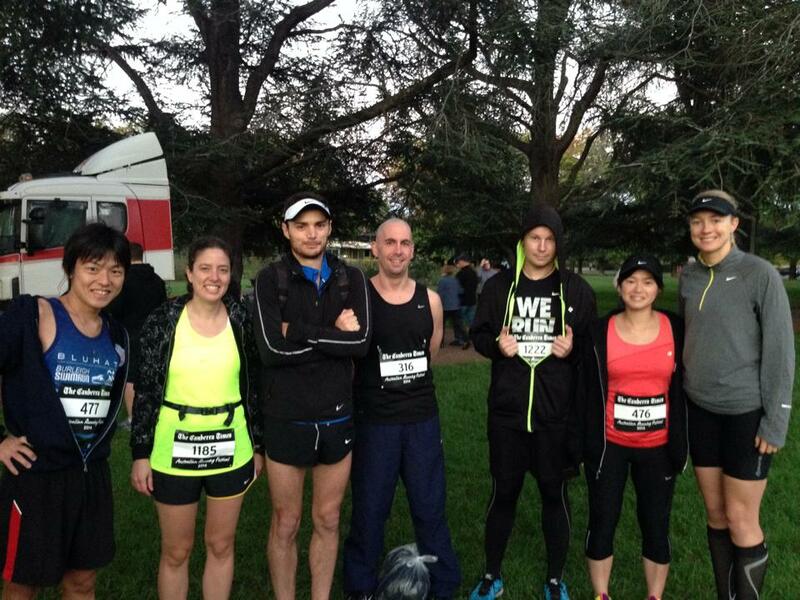 Janet and Brendan had both smashed their first marathons (front left) and I loved hearing their stories about the race. We congratulated each other and said our goodbyes. I look forward to seeing them all again at run club in just over a week. Georgie and I headed back to her car and much to her surprise that I didn’t fall asleep in the car on the way home, we chatted all the way and scoffed down some pizza for dinner when we got to my place. Best pizza ever!! Looking back I’m not sure why I was so hard on myself about how slow my run had been. 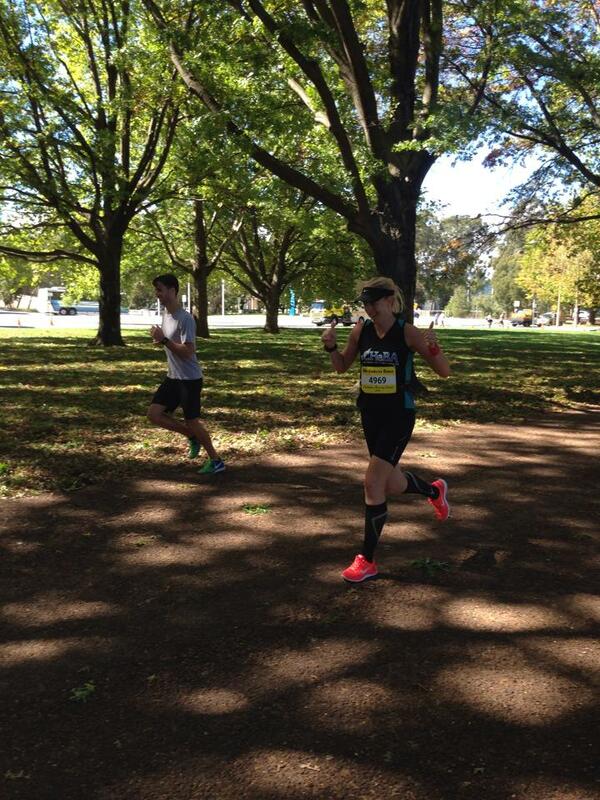 I hadn’t been my fastest, but I’ve learnt that I can go on even when my body and head are telling me to stop. And I’m so glad that I pushed through because my legs and feet are feeling a million times better today (Wednesday) and my groin pain has gone al together. Though I know that I have lots more stretching and cross-training to do over the next few weeks so that my legs can recover fully. 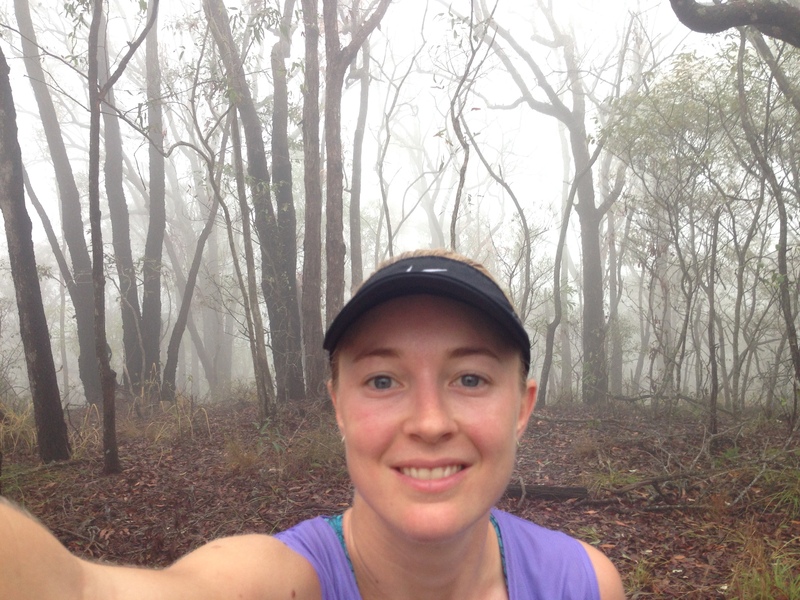 Only 2 weeks until the Mt Solitary Ultra in the Blue Mountains, bring it on!! 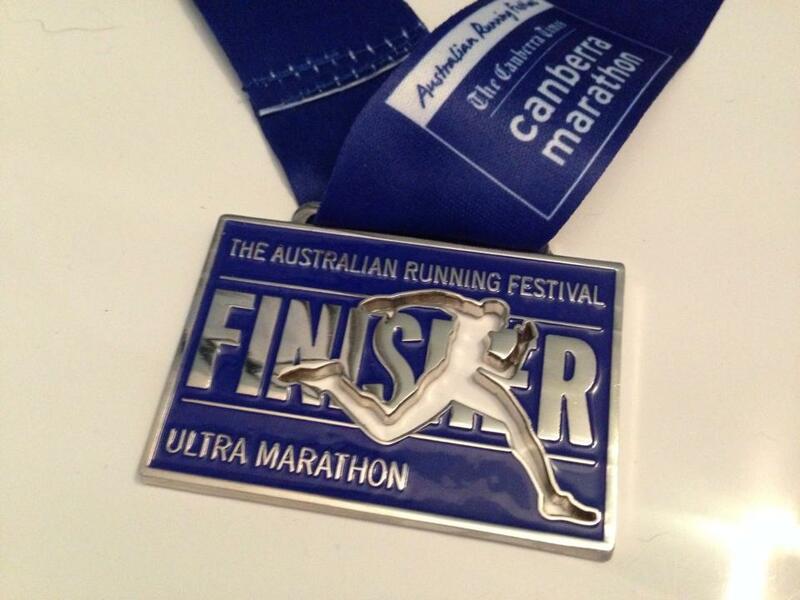 This Sunday I will attempt to run my furthest distance yet, a 50km road race as part of the Australian Running Festival in Canberra. I’m getting very nervous about this event, which is probably a good thing, but it’s going to be a great weekend as I am travelling down with the SHR crew and lots of my running mates from the Striders are competing too. The Ultra Marathon course covers the same course as the marathon, with an extra loop at the end.Below is the elevation chart, which looks much easier than some of the tough climbs that I have done on the trails over the past months, however I know it will be challenging in many other ways (especially that last 10km – ouch!). Originally I was signed up for 10km run on the Saturday, but my training buddies (after much heckling and encouragement) told me to pull up my big girl pants and sign up for the 50km, so I did!! Geez I have rubbery arms!! 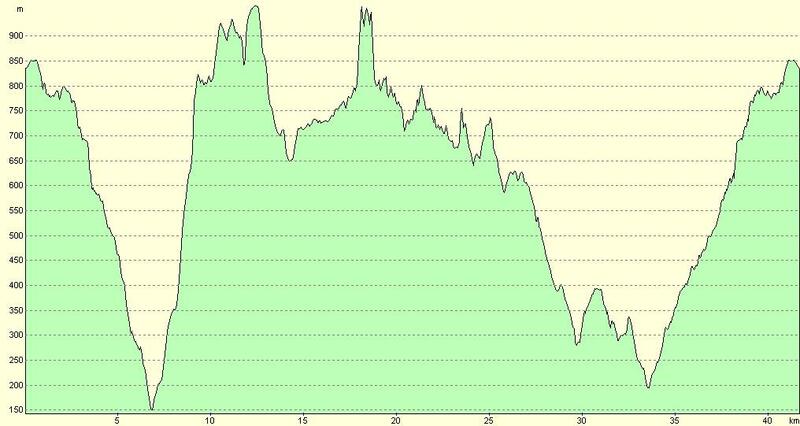 The plan for Sunday is use it as a training run for TNF100, as it’s only 6 weeks away now. So i’ll be taking it very slow and easy for the entire run as it’s going to be about getting the time on my feet. I’ve been reading up about the course and the toughest sections are from 20-30km and 40-50km, so about halfway and right at the end, which means that most runners shouldn’t be pushing it too hard to early anyway. 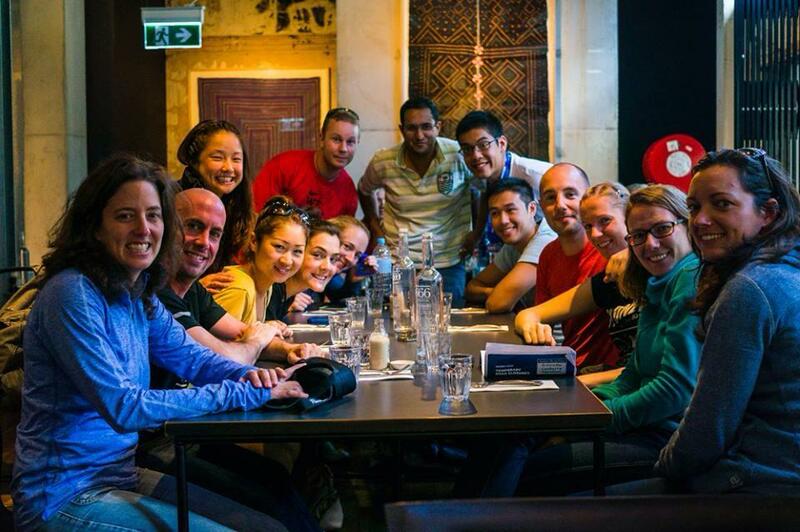 It will be so nice to know that lots of my running friends will be the course that day too and I hope to encounter them all at some stage, even if it’s only at the start line to wish them good luck (Shaun Hardy). The rest of my week will be spent doing yoga, getting a massage, walking the dog around the block and taking it easy. Tapering is much needed but very hard at time so I just need to keep my mind busy. Yesterday I got up at 3.15am to get a long run in before work. And yes it was quite tough getting out of bed at that time, but I plan ahead the night before I run early and had everything ready to go for when the alarm went off. All I had to do was throw on some running gear, grab my pack and I can be out the door within 10 minutes. I ran with a friend called Jason who I had met at the training camp in the Blue Mountains a few months back and we’ve kept in touch via facebook. There were a few of us at that camp who (we realised) live close by so we exchanged details and planned to do some training runs together. It’s amazing the amount of people who I have kept in touch with since that camp, it’s been most helpful in more ways than I ever thought possible. Jason and his mates (Andy & Clint) run together regularly before work most days, and they’re all training for The NorthFace100 like me, so when he emailed me yesterday asking if I’d like to come along I jumped at the chance. It would be good “night” training for me and a chance to test out my new Hokas. So we met up at the Sutherland Bike Track car park at 3.55am and headed across and over the Loftus train station. We went along a couple of streets and eventually hit a gate that led to the fire trail we would be taking today. Most of the run follows a big pipeline and I’ve heard about locals who’ve run this before. I’ve wanted to run the tracks close to home before but haven’t known many people who’ve run them and I’m too much of a scaredy cat to go by myself. It was pitch black and the only thing lighting the way was our headlamps. I was using a Petzl R+ and 2 of the other guys were using Ayup (I think that’s how you spell it). The Ayup actually had 2 torches so you could have one pointing up and one down towards the ground and they were very, very bright. My headlamp was much more compact (didn’t have the huge battery pack at the back like the others) and you can adjust the direction of the beam quite easily while running as it has a few different setting spots. The Petzl had a couple of brightness settings (as they all do) and I wanted to try the sensor setting yesterday, this setting actually takes information in about how bright the area is in front of you and adjusts the brightness accordingly to save power when less light is needed. And I think as the guys headlamps were much brighter it meant that my torch didn’t have to be at full power for the whole run. 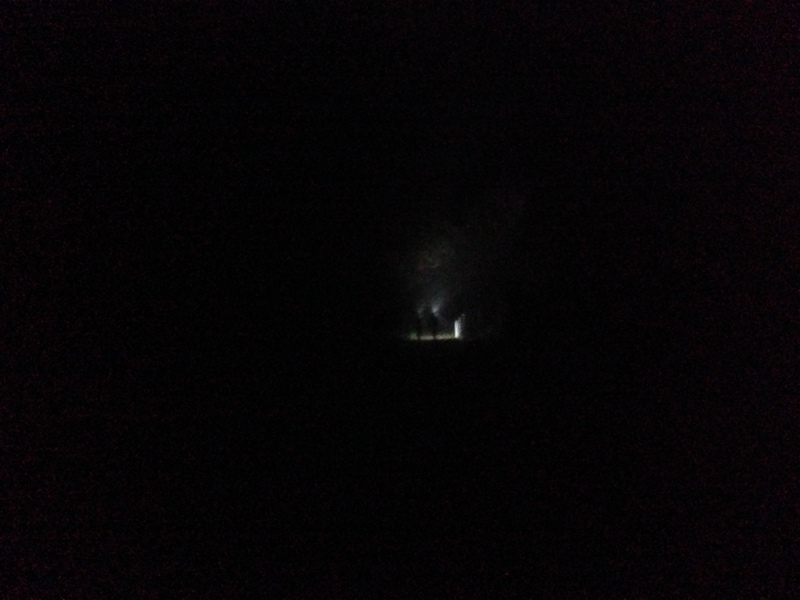 Most of you who read my posts regularly will know that I usually stop and take a lot of photos so i can share my running journey, but during this run I only managed 1 photo and even then by the time I got the phone camera working the guys were so far away from me that you can hardly see them. We ran across a creek and up and down the trails and came out at another road which we crossed and then found another gate which led us back to running along the pipeline again. Luckily Jason knew where he was going as I honestly would have gotten very lost. The guys were running at a pace faster than what I would normally run but I didn’t want to fall behind so I kept pushing myself, only having to walk a few small hillier sections, which they kept running and doubled-back to get me. This was an out and back trail so once we turned around we knew what was coming, and it actually seemed much quicker on the way back. And when we got back to the cars the sun was only just starting to rise over the horizon. What an awesome way to start the day! 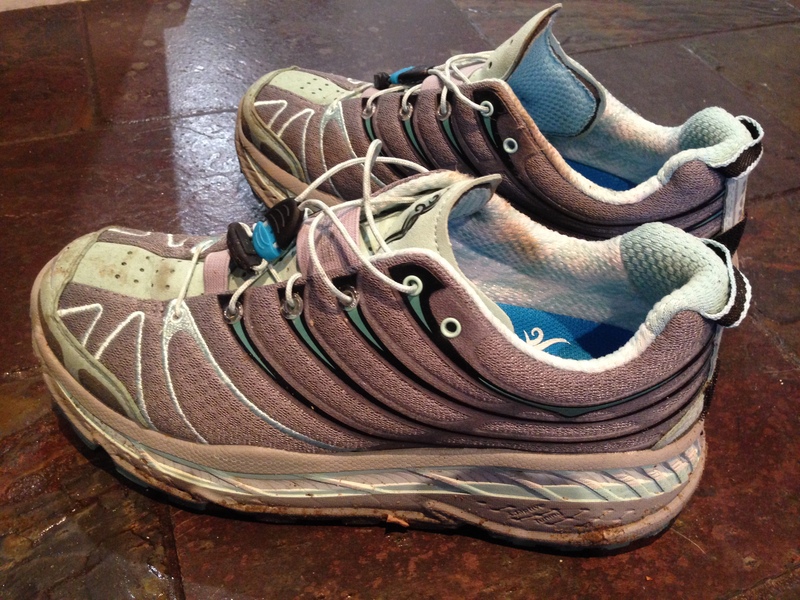 I did not have any problems with my new Hoka One One Stinson Trail shoes and they felt very comfortable, going downhill was a breeze for my knees and ankles due to the extra support they provided. I was a little worried when I bought them that my weak ankles (from years of netball) wouldn’t cope well in them, but after a little while of jogging you hardly even notice a difference. Here’s a shot of them nicely christened from the run. The guys were fun to run with and we chatted a lot and had a few laughs along the way. It’s always great to have new company on the trails and i felt like the time passed so quickly during that whole run. All in all we ran just over 23km and it took us 2 hours and 45 minutes, here’s the Nike+ App information. 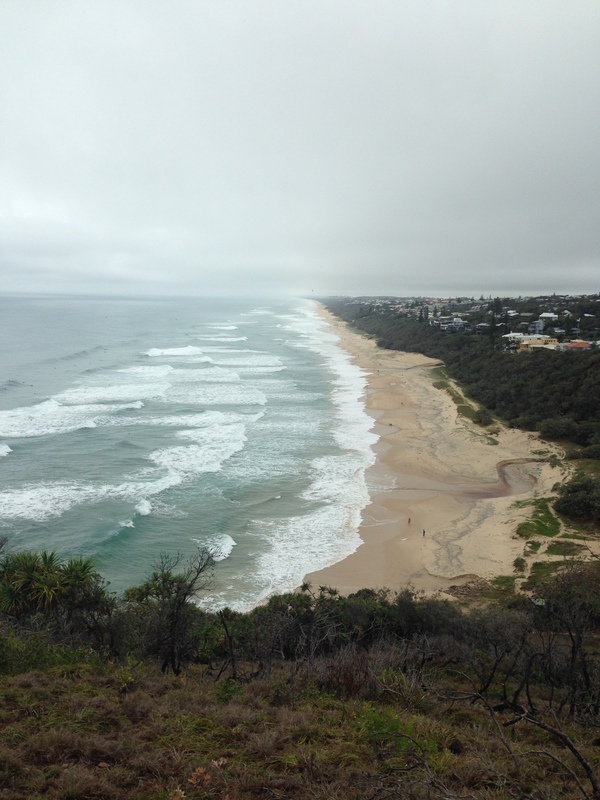 Queensland is a beautiful place to visit so when we got invited to attend a wedding at Sunshine Beach on the Sunshine Coast, I immediately looked up Google maps to see if there were some nearby trails. Well maybe not immediately, but it was pretty soon after I had sent off the acceptance RSVP. 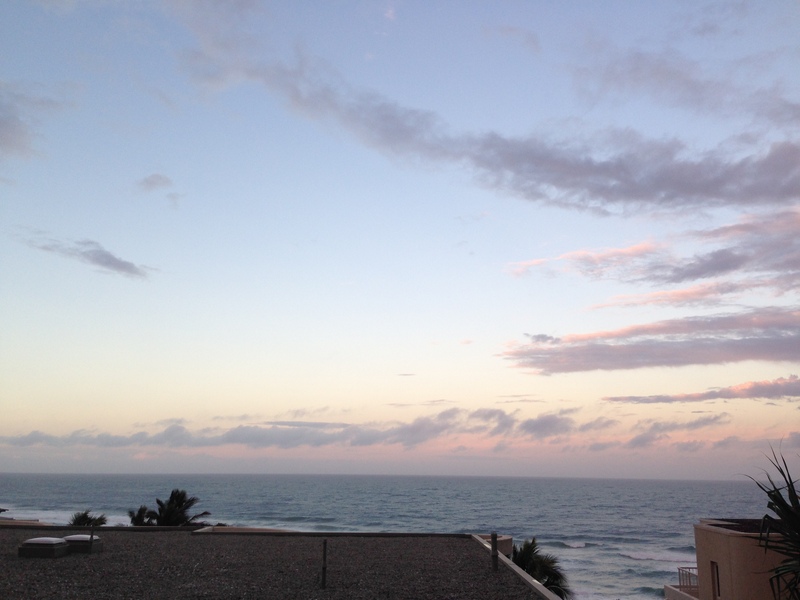 I was travelling with the Outlaws (my name for the in-laws) who are great company and we were staying at a place called the La Mer which overlooked the ocean, check out the view from our apartment when we arrived on Friday night. We had dinner at the Noosa Surf club with most of the other wedding guests and I drove us home for an early night before tomorrow’s run. The alarm went off at 5.30am so I could be dressed and ready to run just before the sun came up. I really love being able to catch the sunrise when I’m out running, especially as it’s generally cooler at that time of the day too. 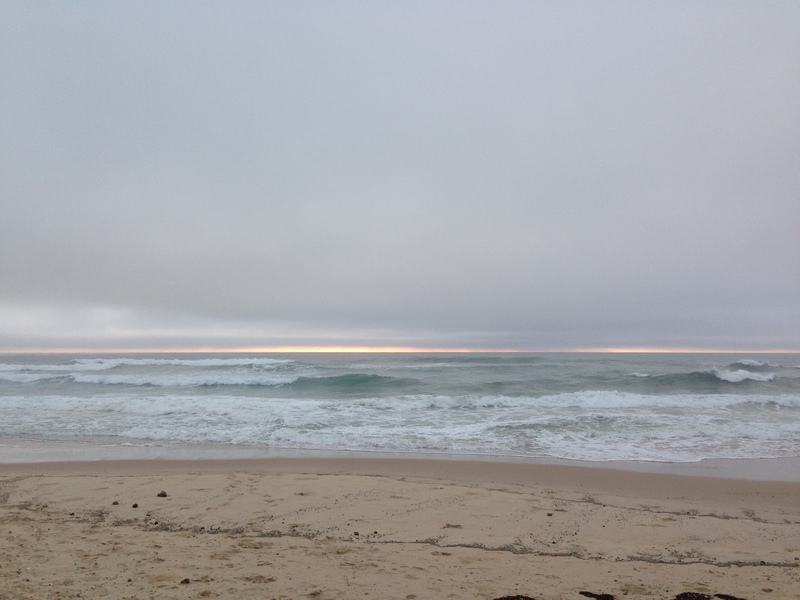 But unfortunately there was a lot of cloud cover and a lot of fog so there wasn’t much of a sunrise that day. I followed this trail up and down and around the coastline and saw many other walkers ans runners out doing the same thing. I actually managed to overtake a few runners which is not like me. It was so nice to be running somewhere different and the view was magnificent, however the humidity soon slowed me right down as I was sweating like a pig and my clothes became quite damp very early on. Gross! I got talking to some lovely local ladies (say that fast a few times) at a spot called Hell’s Gate (see image below), they gave me a run down on the Park which was very helpful. We chatted about area and they talked about you wouldn’t want to get swept into He;;’s Gate or it would be a death trap! 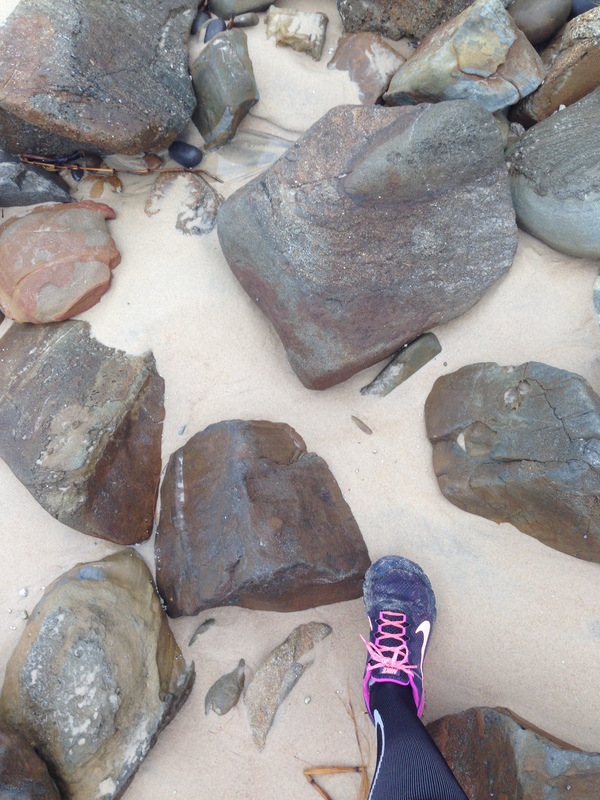 I wished them well and kept running along the coastal track. At the end of it was a parking area and some public toilets so i made good use of the fresh running water and filled up my water bottle. I was wearing a Camelbak 600ml flask belt and the bottle sat in the small of my back. The belt had a pocked in it so that I could carry some gels and my mobile phone so it was perfect for today’s run. 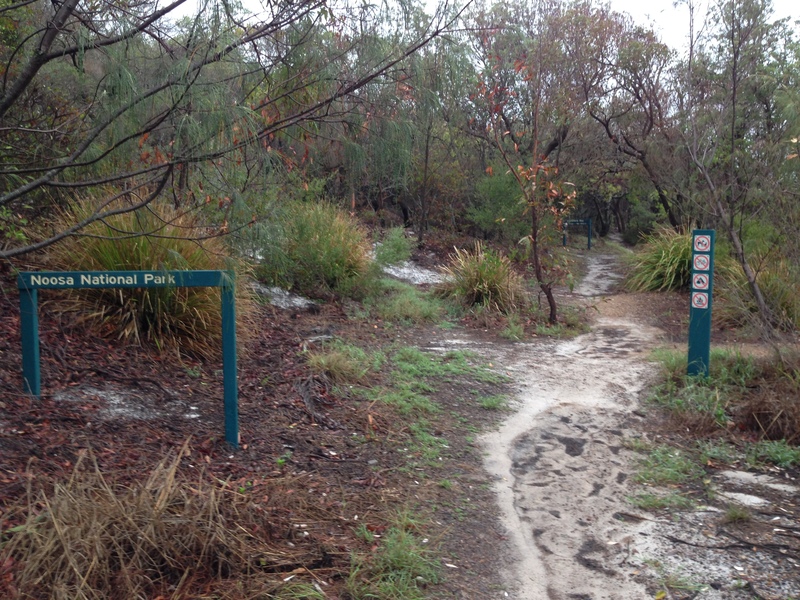 After that pit stop I decided to take the Tanglewood Trail which also linked in with the Noosa Hill Trail. 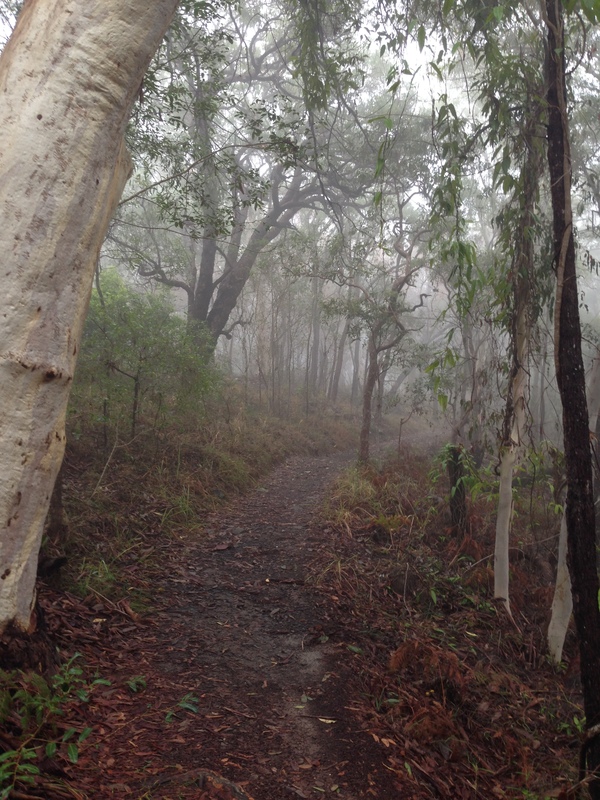 The fog got very heavy and I looked very creepy by the time I got to the top of the hill, and I almost wet my pants when a bush turkey came out of nowhere and scared the beejeezus out of me!! And here’s an awful selfie!! Yuck!! 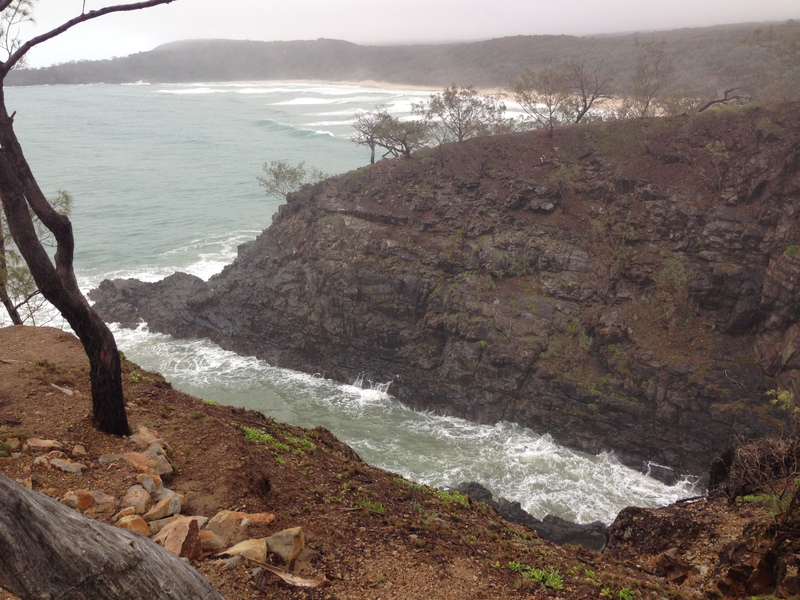 The Noosa Hill Trail took me back down to where the Coastal Track had ended so I filled up my water bottle again and set out to complete the Tanglewood Trail again, as I had only done part of it the first time as I took the turn for the Noosa Hill about halfway along it. I followed that trail all the back back around to one of the sections near the beach at the start of my day’s run and decided to head back along the coast down towards the apartment. There was another little trail along the beach front over the cliff top and down some huge stairs and I was keen to check it out. 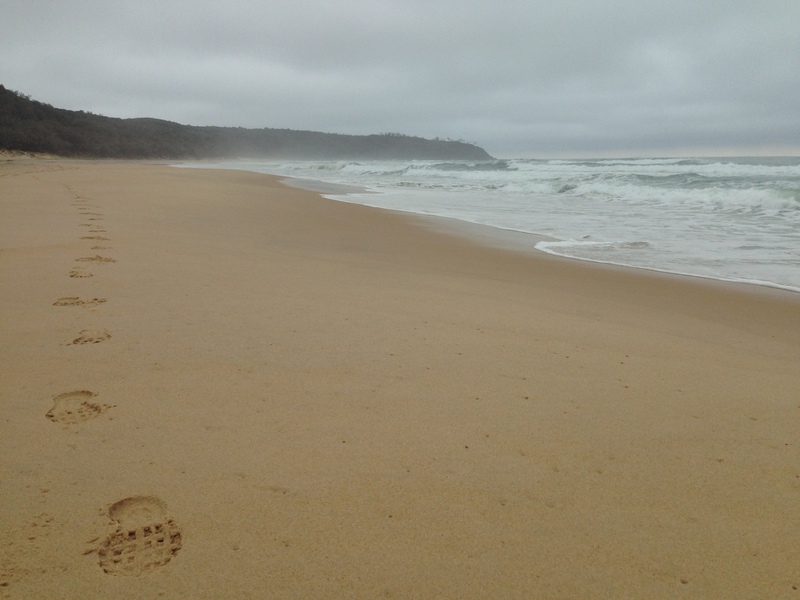 So I ran along the beach and I was the only person around for miles…. At the south end of the beach I had to compete with the rocks and the tide coming in to reach the trail I wanted but it was quite cool and refreshing for my feet. I eventually found the trail which was quite hard to spot and is not signposted, but I hoped that my trusty map would not fail me. 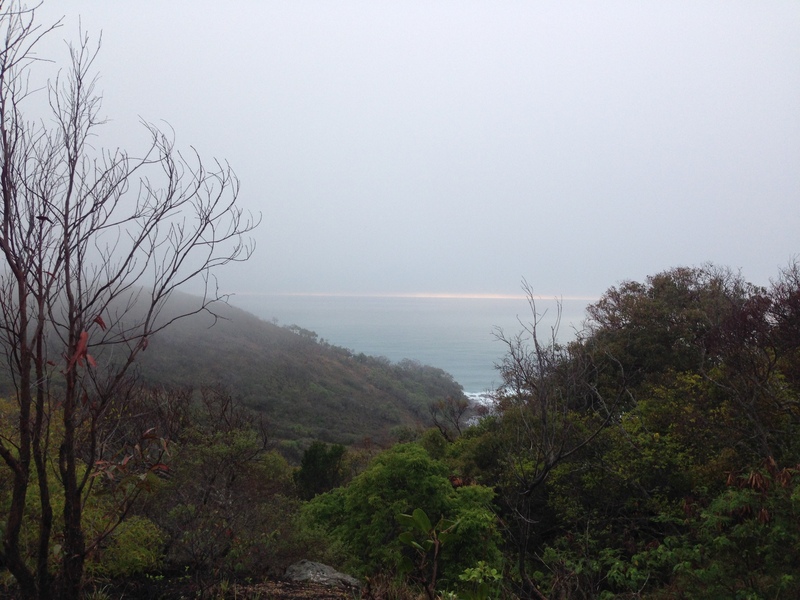 I saw a couple more bush turkeys and headed up to the top of the cliff and the view was spectacular when I got there. I rounded the bend a little further along the track and there was a concrete staircase going straight down all the way to the beach. At 2 sections on the staircase there was actually a seat for you to sit down and although it looked very inviting I did not accept the invitaition and kept on running. The soft sand under my feet at the bottom made my legs feel heavier than ever and I slowly dragged my body down the coastline. 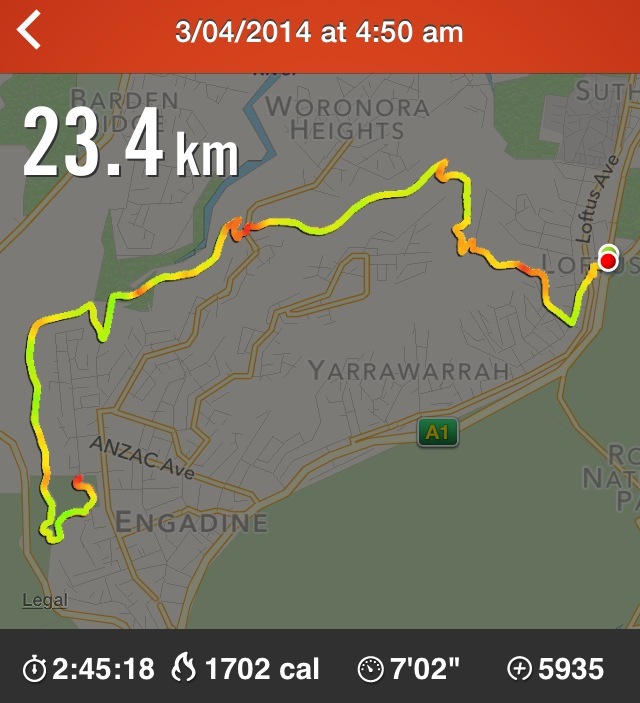 By the time I got back to the apartment I had been running for 2 hours and completed 14km, not a bad effort. I had been hoping for a lot more kms but given the humidity I decided to cut it short and rest before the wedding. 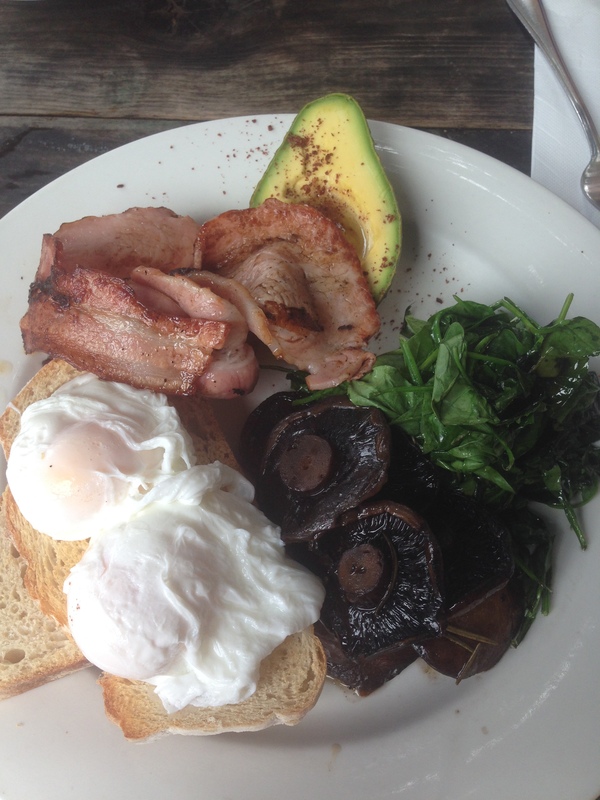 I had a quick shower and we headed for breakfast, how good does this look? It was delish! !